Pakistani asylum seeker, 23, murders driver and ploughs into Berlin Christmas Market. 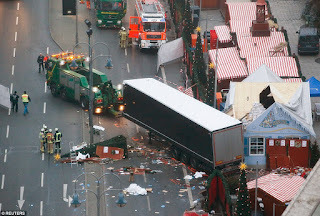 A Pakistani asylum seeker believed to have used a hijacked 25-tonne lorry to murder 12 people and injure 48 more at a Berlin Christmas market had only been in Germany for months and was already known to police because of petty crime, it was revealed today. The masked 23-year-old named as Naved B, who entered the country under a false name on New Year's Eve 2015, turned off the truck's lights before mounting the pavement at 40mph and ploughing through crowds of people enjoying mulled wine after work. The vehicle laden with steel cargo ripped through stalls and shoppers at 7pm on Breitscheidplatz Square, outside the Kaiser Wilhelm Memorial Church in the German capital's main shopping area. Witnesses said victims were sent flying like bowling pins as the killer driver steered at them before jumping out of the cab and racing from the scene. Police managed to take the masked terror suspect alive at a nearby zoo after a 'hero' witness in the Christmas market gave chase on foot while giving officers second-by-second updates on his phone. Naved B is in a Berlin police station today. Police confirmed the lorry's original Polish driver, who was transporting steel beams into Germany, was last heard from at around 4pm yesterday and was found shot dead in the cab in an apparent murder hijacking. 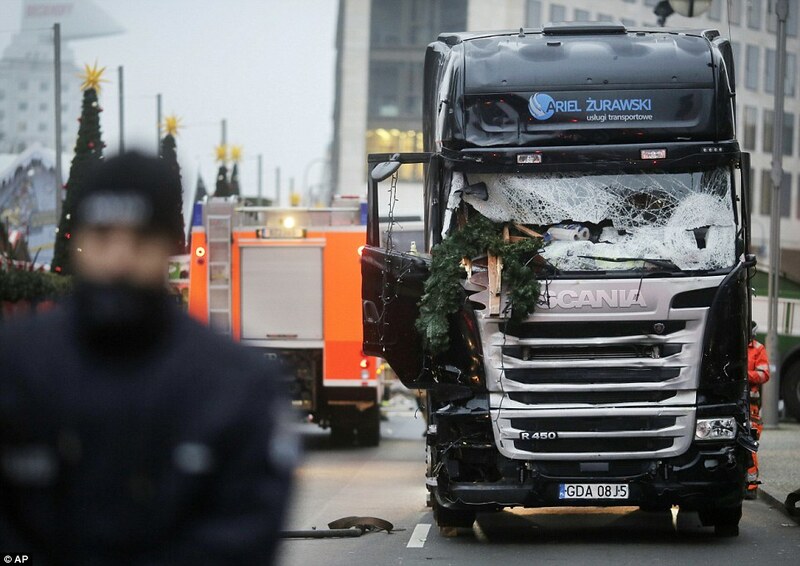 German officials have said that the driver is a Pakistani national who entered Germany via the Balkans on December 31 and February as an asylum seeker. He was believed to be living in a refugee camp at Berlin's Tempelhof airport, which was raided by an elite group of armed anti-terror police at 4am this morning. The terror attack could be a political disaster for Angela Merkel, who will seek a historic fourth term as German Chancellor next year. The German leader has staked much of her political capital in opening up Germany's doors to refugees and in doing so divided a reunited land. 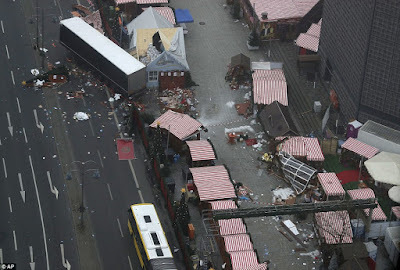 In a further hammer blow, security sources have suggested that police in Berlin were warned that an attack on a Christmas market could be imminent.